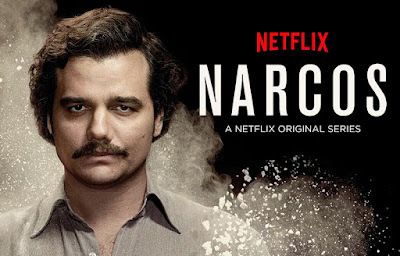 I've been watching and enjoying Netflix's Narcos this weekend. Vinnie Mancuso at the Observer offers an interesting interview with the two DEA special agents portrayed in the series. Although they haven’t been official partners since 1994, it’s not hard to gauge the rapport between former DEA Agents Javier Peña and Steve Murphy — Mr. Peña is quiet, more thoughtful, Mr. Murphy an energetic West Virginia native with the accent to match. When I met up with them in their room at the San Carlos Hotel on the Upper East Side, the two men could not have seemed any more unassuming. If you saw them on the street, you couldn’t picture streaming-giant Netflix basing a sprawling ten-episode series on their lives. But then you start to hear their stories. Both Mr. Murphy and Mr. Peña were part of the Search Bloc, an informal task force in Colombia created in 1992 solely to hunt drug trafficker Pablo Escobar. At the time the world didn’t even know what to make of Escobar, who in his time would be seen as both a Robin Hood-esque savior and mass-murderer, all while making the Forbes International Billionaire list. Bottom line, Escobar and his Medellin Cartel ushered in the idea of high-production cocaine trafficking, which eventually made its way to our Miami shores. In the years leading to Escobar’s “imprisonment” in La Catedral, and the violent 18-months that proceeded his escape, Murphy and Peña played their parts to hunt down and stop the most powerful drug lord in the world. In 2013, executive-producer Eric Newman called Mr. Murphy to discuss an idea he had, a TV show about the hunt for Escobar that would focus specifically on Murphy and Peña. Two years later, Netflix is set to release all ten episodes of Narcos next Friday, with Boyd Holbrook playing Steve Murphy and Game of Thrones‘ Pedro Pascal as Javier Peña. What started as a chat with Mr. Murphy and Mr. Pena about the show turned into a first-hand account of one of the most violent times in human history, and what we’re doing wrong to make sure it doesn’t happen again. Observer: You guys are “technical consultants” on Narcos. What does that entail? Javier: [laughs] I mean, we told them the story. We told them the facts of what happened. There are some people, which is true, that I didn’t get along with at the embassy. Especially the CIA people, I never got a long with them. So they’re using some of that. ... How important to you think Narcos is in terms of awareness? Steve: There are a couple of ways to look at this, and I’m going to get on my soap box a little bit. One is: we all should look at history so we don’t repeat the same mistakes.Because now we’re looking for Chapo Guzman again, right? So they’re using what we did 20 years ago as a model. Has cocaine trafficking changed any? No. As long as there is supply and demand, simple laws of economics, someone will supply the product. Do we need to do away with the enforcement arm because it hasn’t worked as effectively as we want it to? Absolutely not. You still have to have that enforcement arm to try and make people comply. Maybe we should do a better job of educating. You have “Just Say No,” you have “DARE,” I think they’re outstanding programs. But, it’s not enough. We need to do something more. Legalization is not the answer. Just go look at history. There are multiple countries in Europe that have tried legalization, and it has not worked in one place yet. Now we’re going with legalizing marijuana here in the United States, for medicinal purposes. Okay, if there is a legitimate medicinal purpose, okay. Let that person smoke pot. But not these thousands and thousands of people. If we’re going to have these marijuana cultivation farms, and distribution centers, let’s impose some standards on the people who run those places. A lot of the time, if you check that person’s rap sheet, they’ve been arrested multiple times. There’s no professionalism other than ‘well, I’ve been smoking dope for 20 years.’ What’s the answer? I don’t know. If I knew, we’d all be rich, and we’d be in a fancy office for this interview and not a hotel room.